…and the elephant is not involved. Animal Defenders International has released shocking footage from behind the scenes at the winter quarters of Bobby Roberts Super Circus, which graphically shows violence and confinement of circus animals. ADI secured footage over a three and a half week period from a camera observing activity in a barn where the animals are kept when not touring, which shows a staggeringly high level of violence and serious animal husbandry flaws. 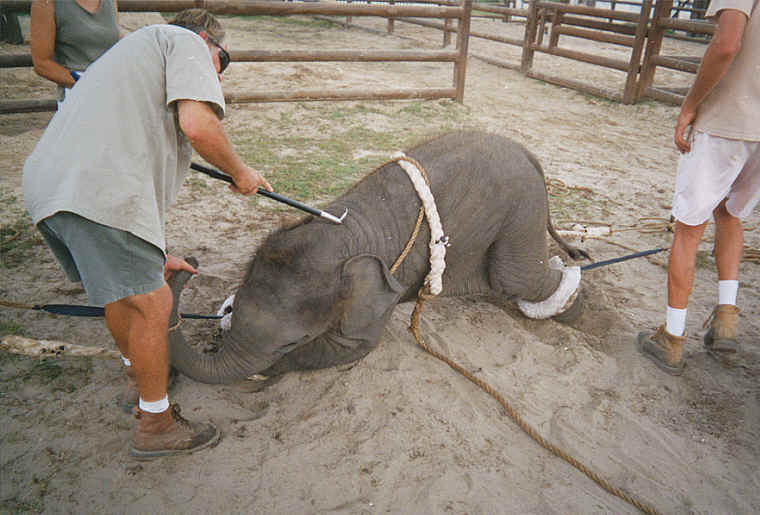 Incidents included Annie (Anne), an elderly, severely arthritic 57 year old elephant being hit with a metal pitchfork and kicked around the face and body 48 times over the period of observation by workers, who are also seen beating and spitting on a camel and beating miniature ponies and horses on numerous occasions. 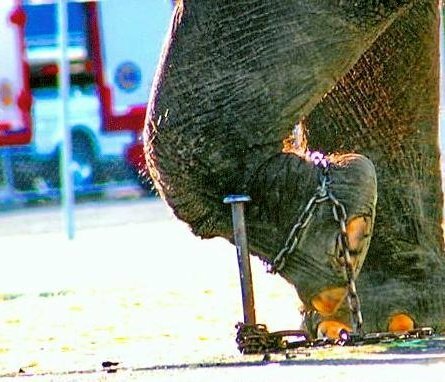 The disturbing footage also shows Annie constantly chained for the entire period of filming by her front and arthritic back leg with only enough room to take one step forward or backwards. Her chains were only changed to different legs twice, ADI believes this will clearly cause her pain and discomfort. It was noted that the feeding regime was poor. What makes this case all the more disturbing is that the circus proprietor Bobby Roberts, who has claimed publicly to take good care of Annie as ‘she is a family pet’ and ‘part of the family’, is clearly captured on camera kicking Annie on the trunk, an extremely sensitive part of an elephant’s anatomy, and this is done in front of a worker. As government prepares to make an announcement within the next few weeks regarding the fate of animal circuses in the UK and makes the decision to implement a total ban or self regulation, Animal Defenders International believes that this new evidence provides them with only one option – a total ban on the use of wild animals in circuses. Jan Creamer, ADI’s Chief Executive said: “Annie’s tragic story symbolizes the plight of circus animals and is a shocking indictment of the circus industry at a key time as government considers a ban on the use of wild animals in circuses. We have presented successive governments with extensive evidence from our undercover investigations over the years into UK circuses that proves conclusively that routine violence and deprivation is endemic within the industry. ADI has now exposed the shocking abuse of animals in UK circuses from several random undercover investigations over the last fifteen years. Only recently, in 2009, the beating of elephants at the Great British Circus was exposed and now in 2011 Bobby Roberts Super Circus shows that this is a way of life at the circus. A clear pattern has been proven and this time the government needs to act. Tim Phillips, ADI’s Campaigns Director said: “The release of this footage stops any attempt by UK government to ignore the will of the public. It is clear that self-regulation is not an option in this industry. 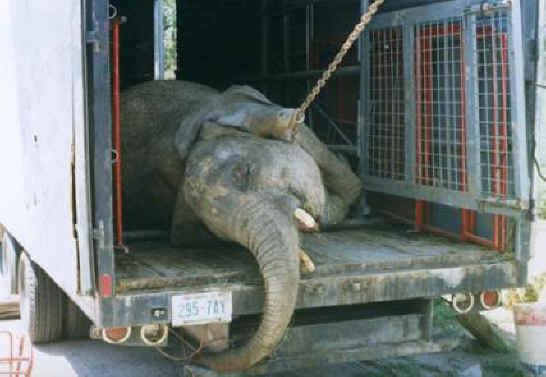 And to the circus industry, ADI says enough is enough. Jan said: “I have no doubt that it will be claimed that this is an ‘exception’ and/or that the owner was not aware of the abuse, but the evidence is now conclusive. Each time we expose the cruelty, the circuses give a similar range of excuses. Tim concluded: “Our latest investigation shows how animals like elephants suffer in the travelling circus. In the name of entertainment they are beaten, jabbed with hooks and hit with pitchforks, chained up for hours every day, and pushed into metal boxes each week where they remain for hours on end whilst the circus moves to another site. And when they are meant to be resting in their winter quarters the abuse and cruelty continues. The Bobby Roberts Super Circus began its UK tour on the 24 March. Potential visitors are being asked to vote with their feet and stay away. ADI is consulting with its lawyers to see what the potential is for legal action.